Objective: When one TNFα blocker (etanercept or infliximab) has failed, to determine whether it makes sense to treat patients with the other. Patients and methods: Since 1999 patients treated with etanercept or infliximab have been systematically followed up at our institution in the STURE database. We identified 31 patients who had received both agents. Results: Eighteen patients received etanercept first; discontinuation was mostly due to lack of efficacy. DAS28 values had improved only slightly with etanercept, with a mean (SEM) best DAS28 value of 4.8 (0.6). After switching to infliximab, the mean best DAS28 was 3.6 (0.6)—significantly better than the previous result (p<0.05). Similarly, the mean best ACR-N during etanercept treatment was 17.2 (6.65) and during subsequent infliximab treatment 40.4 (10.6) (p = 0.08). Thirteen patients received infliximab first; discontinuation was mainly due to adverse events. The best DAS28 value achieved during etanercept was 3.6 (0.4) compared with 4.1 (0.4) for infliximab (p<0.05), but the change in DAS28 was not different and ACR-N were similar for infliximab and etanercept in this group. Conclusion: For patients with insufficient efficacy from etanercept, treatment with infliximab provided better results, suggesting that a trial of infliximab is reasonable for such patients. For patients who discontinued infliximab owing to adverse events, treatment with etanercept gave at least similar clinical efficacy. Taken together, these data provide support for a trial of the reciprocal TNFα blocker in patients when one such agent has failed. 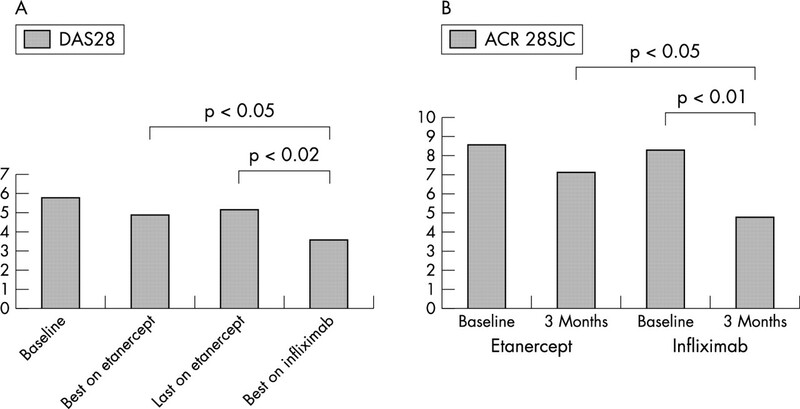 The tumour necrosis factor α (TNFα) antagonists etanercept and infliximab are efficacious in a variety of clinical settings in the treatment of RA1,2 and other inflammatory arthritides.3,4 No clinical trials have directly compared the two agents. Comparisons across trials, which have limited applicability, do not show major differences in clinical outcomes with the two drugs. Longitudinal follow up studies have also shown similar efficacy for the two agents.5,6 The most important mechanism of action seems to be the binding of free soluble TNFα, thereby preventing its binding to the TNFα receptor, and this effect is shared by the two agents. However, certain biological differences between the two agents may or may not affect their efficacy. Thus, the IgG1 antibody molecule infliximab can, in principle, activate complement or initiate antibody dependent cellular cytotoxicity, thereby causing cytolysis of cells bearing TNFα on their surface, such as activated macrophages. In contrast, etanercept does not activate these effector pathways. However, etanercept can, besides blocking TNFα, also block TNFβ (lymphotoxin), but the pharmacological significance of blocking TNFβ is not known. Not all patients respond to the TNFα blockers, and some who do respond develop side effects, which limit treatment. In these situations, an important practical question is whether it is worth prescribing the other TNFα blocker, or whether this is simply a waste of time and money. To examine this question we used the STURE database to characterise the results in patients in whom both treatments had been tried. The STURE database collects efficacy and safety data for all patients starting biological treatments at the major hospital in Stockholm, as part of a nationwide registry of biological agents (ARTIS). The assessments are done at 0, 3, 6, 12 months, and annually thereafter, and include the American College of Rheumatology (ACR) core outcomes (the swollen joint count (SJC) and tender joint count based on 28 joints,7 visual analogue scales for global health and for pain, the Health Assessment Questionnaire disability index, erythrocyte sedimentation rate and C reactive protein, and a five point Likert scale for doctor’s assessment of global disease activity), record of concurrent drugs, employment status, and side effects. At each assessment the disease activity score (DAS)287 is calculated. Although the STURE database is part of the ARTIS national biological agents safety registry, this study was performed using only data collected and analysed at the Karolinska Hospital. For this study we selected those patients who had been treated with both etanercept and infliximab. Thirty one such patients were identified: 18 who had been treated with etanercept first and then switched to infliximab, and 13 for whom the order was reversed. Etanercept was always given at 25 mg subcutaneously twice weekly. Infliximab was given according to the product resumé—that is, at 3 mg/kg/infusion, given intravenously at 0, 2, and 6 weeks and every 8 weeks thereafter. The measures of greatest interest for this study were the best outcomes obtained with each drug in each patient. Thus, for each patient the best DAS28 and best SJC with each drug were selected and used for formal comparisons. We also calculated the numeric ACR (ACR-N) at each assessment8 and compared the best ACR-N values with either drug. Obviously, this also allowed comparisons of the number of ACR20 responders.9 In addition, the values immediately before starting each treatment and when treatment was discontinued were also analysed. The STURE registry is maintained in the RAMONA database, and all calculations were made using the StatView 5.0.1 software package (SAS systems, Cary NC). Of the 18 patients who were treated with etanercept first, the reason for switching to infliximab was lack of efficacy in 14, side effects from etanercept in 2 (rhinorrhoea 1, nasal congestion 1), and unknown in 2 patients. Fourteen of these patients had rheumatoid arthritis (RA) and 13 were seropositive, two had a diagnosis of juvenile chronic arthritis but were now adults with an RA-like clinical course, and two had a spondyloarthropathy with predominant peripheral joint involvement. Fifteen were female, with a mean age of 53 years, mean disease duration of 15 years, and the mean number of disease modifying antirheumatic drugs (DMARDs) used previously was 5.8 (table 1). These patients had been treated with etanercept for a mean (SEM) of 6.8 (1.7) months before switching to infliximab. Of these 18 patients, 11 had been given methotrexate (MTX) along with the etanercept treatment. When treatment with infliximab was started, MTX was continued in those 11, and added to the treatment in an additional four patients; three patients did not receive MTX even when they were treated with infliximab. These 18 patients had modest improvements after etanercept was started. Their best DAS28 values during treatment were only slightly better than those at baseline, consistent with the fact that they later were switched to infliximab because of lack of efficacy. At the point when the switch to infliximab was made, the mean activity was close to the original baseline level. After infliximab treatment was started, the DAS28 improved significantly, resulting in a mean (SEM) best DAS28 value that was significantly better than the value just before starting infliximab (5.2 (0.9) v 3.6 (0.6), p<0.02). More germane to the question examined in this study, the best DAS28 during infliximab treatment was also significantly better than the best result obtained with etanercept (4.8 (0.6) v 3.6 (0.6), p<0.05) (fig 1A). As is generally the case, significant clinical responses to infliximab occurred early, within the first three months of treatment, but the mean time at which the best DAS28 result was obtained in this group was after 6.0 (1.4) months. When the swollen joint counts were analysed a similar pattern was seen—that is, a modest response with etanercept, and a more definite improvement with infliximab that was significantly better than the first response (fig 1B). Similarly, the best ACR-N responses with infliximab showed a higher mean value than during etanercept treatment, but this difference did not reach significance (17.2 (6.65) for etanercept v 40.4 (10.6) for infliximab, p = 0.08; data not shown). Likewise, ACR20 responses were more common with infliximab than with etanercept in these patients (12 (67%) v 6 (33%), data not shown). When the four patients with diagnoses other than RA were excluded, the numerical results were essentially unchanged (not shown). This group of patients continues to be followed up in our registry and good clinical responses have been maintained for up to 24 months. In the two patients who discontinued etanercept because of upper airway symptoms, these did not recur during infliximab treatment. Thus, in these patients, when etanercept failed, better clinical results were achieved with infliximab. (A) Disease activity by DAS28 in patients treated first with etanercept, then with infliximab. Values shown are the mean value at baseline (before etanercept treatment), mean best value during etanercept treatment, mean value at last visit while on etanercept (when the decision to switch was made), mean best value with infliximab. Comparisons are by paired two tailed Student’s t test. (B) Swollen joint count in patients treated first with etanercept, then with infliximab. Values shown are the means at baseline and after three months for each treatment. Comparisons are by paired two tailed Student’s t test. Of the 13 patients who were treated with infliximab first, the reason for switching to etanercept was an adverse event in 11 (infusions reaction 7, liver toxicity 2, change in olfaction 1, unspecified 1), and miscellaneous in 2. Thus, the clinical situation differed from that of the previous group. Table 1 gives the clinical characteristics of these patients. These patients had been treated with infliximab for a mean of 5.5 (1.2) months when this drug was discontinued. All 13 patients had been treated with MTX as well as infliximab. When treatment was switched to etanercept, MTX was continued in eight and discontinued in five patients. Figure 2A shows the DAS28 values during treatment with the two agents. A significant response was seen with infliximab. At the time this agent was discontinued the response had become somewhat less. Because it takes time to start treatment with etanercept (special approval has to be sought as the availability of etanercept in Sweden is limited) an additional worsening in DAS28 was seen when etanercept was started, but this second baseline value remained considerably better than the original baseline. However, after the inception of etanercept, a sharp decrease in the DAS28 values was seen, which was highly significant compared with the previous value and also significantly better than the best result seen with infliximab. As is generally the case, significant clinical responses to etanercept occurred early, within the first three months of treatment, but the mean time at which the best DAS28 result was obtained in this group was after 7.0 (2.3) months. When swollen joint counts were analysed a similar pattern emerged, but the difference between the best results with infliximab and etanercept did not reach significance (fig 2B). Moreover, the ACR-N responses to the two agents were virtually identical, and the number of ACR20 responders with each drug was similar (not shown). This group of patients continues to be followed up in our registry and good clinical responses have been maintained for up to 24 months. The adverse events that led to the discontinuation of infliximab (as described above) all resolved and did not recur during treatment with etanercept. Thus, in patients who discontinued infliximab owing to adverse events, results can be achieved with etanercept that are at least equal, and in some analyses better, than the results seen with infliximab. (A) Disease activity by DAS28 in patients treated first with infliximab, then with etanercept. Values shown are the mean value at baseline (before infliximab treatment), mean best value during infliximab treatment, mean value at last visit while on infliximab (when decision to switch was made), mean value just before starting etanercept treatment, and mean best value on etanercept. Comparisons are by paired two tailed Student’s t test. (B) Swollen joint count in patients treated first with infliximab, then with etanercept. Values shown are the means at baseline and after three months for each treatment. Comparisons are by paired two tailed Student’s t test. An important question for practising doctors is whether it is sensible to prescribe another TNFα blocker if one such agent has already failed. Although in many instances the alternatives are few and the doctor as well as the patient may be motivated to “try anything”, it is none the less important to avoid a therapeutic trial of an agent that has no likelihood of being effective, particularly in view of the risks that do exist with TNFα blockers and the costs of such treatment. Moreover, the number of treatment options is steadily increasing, and in the not too distant future doctors may have to weigh up the potential benefit of a second TNFα blocker with a plethora of other biological and pharmacological treatment options. The current data can only address this question in two specific situations. Firstly, for those patients whose clinical results with etanercept are inadequate, it appears that a considerable gain can be achieved with infliximab. 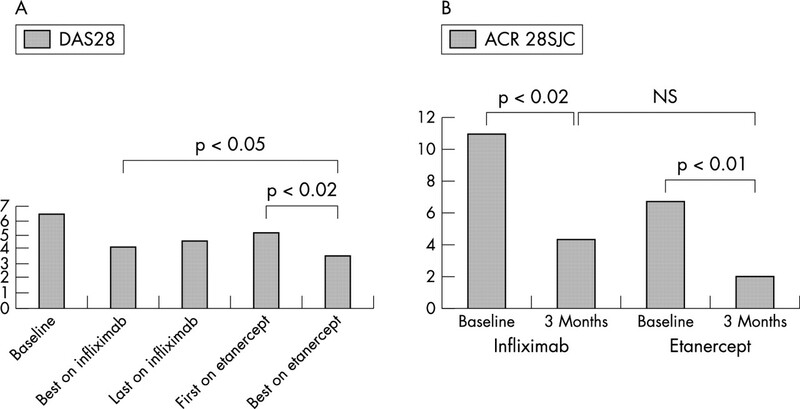 In this study about half of those who failed to reach ACR20 responses with etanercept did achieve that response with infliximab. However, it is important to emphasise that this result was obtained in conditions where only about half the patients were treated with MTX while receiving etanercept, but 15/18 were given MTX with infliximab. Thus, it would be more correct to state when etanercept fails with or without MTX, infliximab with MTX can give a significantly higher number of responders. Infliximab treatment had failed in the second group of patients mostly because of adverse events. In fact, these patients had excellent responses during infliximab treatment, but it is of interest to note that the clinical responses had worsened by the time the treatment was discontinued. None the less, at the time when the etanercept treatment was subsequently started, the activity indices were still somewhat better than at baseline. This leaves open the possibility that some measure of carryover was still present from the infliximab treatment, consistent with the long half life of that drug. In this group of patients the overall results with infliximab were good. When infliximab was discontinued owing to adverse events and etanercept was given subsequently, similar and in some analyses even better results were obtained with the latter agent. In addition, the two patients who had discontinued infliximab owing to lack of efficacy illustrate that even in such patients a switch to etanercept can be succesful. Taken together, the data in this paper provide an indication of the results that can be seen in clinical practice when switching between two TNFα antagonists etanercept and infliximab. However, because the numbers in this study are small, and several patients in each group have diagnoses other than RA, and because there were differences in the concurrent use of MTX, these results should be interpreted with caution. Moreover, because the reasons for discontinuing the first TNF antagonist were dissimilar between the two groups, this study does not allow for a direct comparison between the two groups or between the relative efficacies of the second agent in each situation. The fact that most of the patients who first received infliximab discontinued owing to adverse events, despite having achieved good clinical responses, made the a priori likelihood of showing a better response to etanercept smaller than in the reverse situation. This study illustrates one of the practical issues that clinicians face when trying optimally to use the new antirheumatic agents, and shows that a systematic registry of newer biological drugs is a useful tool to answer daily practice questions. We are continuing our own efforts in the Swedish ARTIS and STURE registries, and would like to encourage others who use such agents to engage in similar longitudinal efforts. In summary, in these two clinical situations: when etanercept fails owing to a lack of efficacy, and when infliximab fails owing to adverse events, trying the alternative of these two TNFα blockers does make clinical sense. Moreland LW, Baumgartner SW, Schiff MH, Tindall EA, Fleischmann RM, Weaver AL, et al. Treatment of rheumatoid arthritis with a recombinant human tumor necrosis factor receptor (pg75)-Fc fusion protein. N Engl J Med1997;337:141–7. Kruithof E, Van den Bosch F, Baeten D, Herssens A, De Keyser F, Mielants H, et al. Repeated infusions of infliximab, a chimeric anti-TNFalpha monoclonal antibody, in patients with active spondyloarthropathy: one year follow up. Ann Rheum Dis2002;61:207–12. Husni ME, Maier AL, Mease PJ, Overman SS, Fraser P, Gravallese EM, et al. Etanercept in the treatment of adult patients with Still’s disease. Arthritis Rheum2002;46:1171–6. Geborek P, Crnkic M, Petersson IF, Saxne T; South Swedish Arthritis Treatment Group. Etanercept, infliximab, and leflunomide in established rheumatoid arthritis: clinical experience using a structured follow up programme in southern Sweden. Ann Rheum Dis2002;61:793–8. van Vollenhoven RF, Harju A, Bratt J, Ernestam S, Brannemark S, Gullström E, et al. Etanercept and infliximab treatment in the Stockholm TNFα antagonist registry: a comparison of two TNFα antagonists. Arthritis Rheum2001;44 (suppl) :S79. Prevoo MLL, van’t Hof MA, Kuper HH, van Leeuwen MA, van de Putte LB, van Riel PL. Modified disease activity scores that include twenty-eight-joint counts. Arthritis Rheum1995;38:44–8. Bathon JM, Martin RW, Fleischmann RM, Tesser JR, Schiff MH, Keystone EC, et al. A comparison of etanercept and methotrexate in patients with early rheumatoid arthritis. N Engl J Med2000;343:1586–93. Felson DT, Anderson JJ, Boers M, Bombardier C, Furst D, Goldsmith C, et al. American College of Rheumatology. Preliminary definition of improvement in rheumatoid. Arthritis Rheum1995;38:727–35.